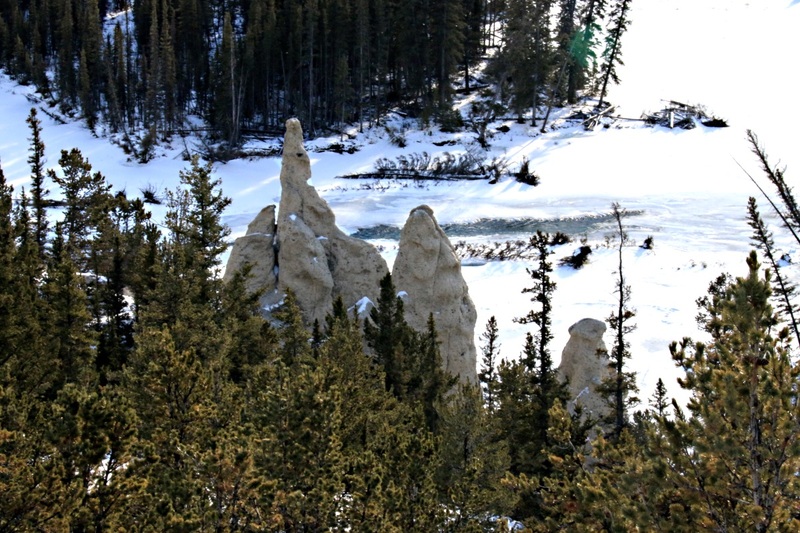 Almost at the end of my stay in Canada, on the last of my days off from skiing, I set out to trek along the Bow River to the Hoodoos, thin pinnacles eroded in soft sedimentary rock. 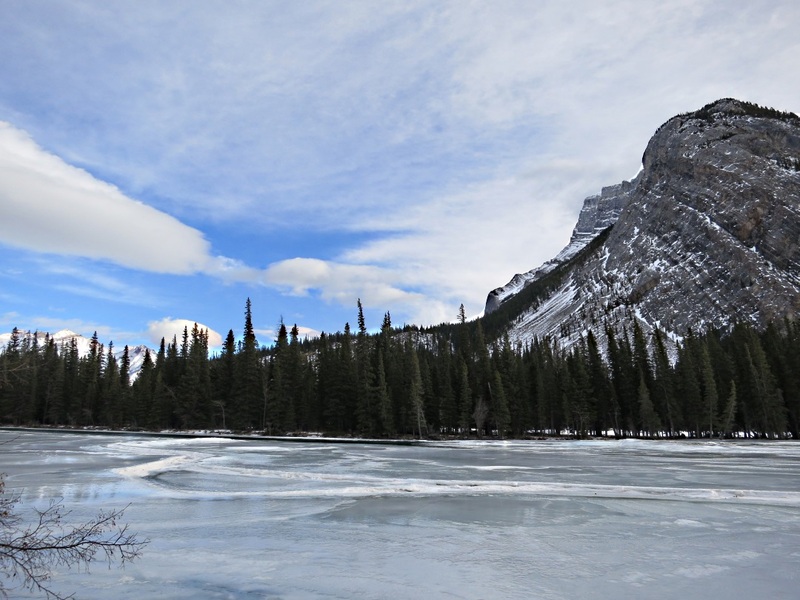 It was 4 years almost to the day that I first walked the Hoodoos Trail, the trek memorable for a number of reasons, not least of which was encountering coyotes howling to each other from the ice on the frozen river barely 100 metres from where I stood. I had heard barking up ahead and assumed it to be dogs taking their people for a walk. When I rounded a bend and saw them on the river I felt comfortable thinking them to be wolves rather than the more unpredictable coyotes and stopped to take photographs. Thankfully they were more interested in each other than in making a meal of me but I was a little unnerved when I found out what they really were. 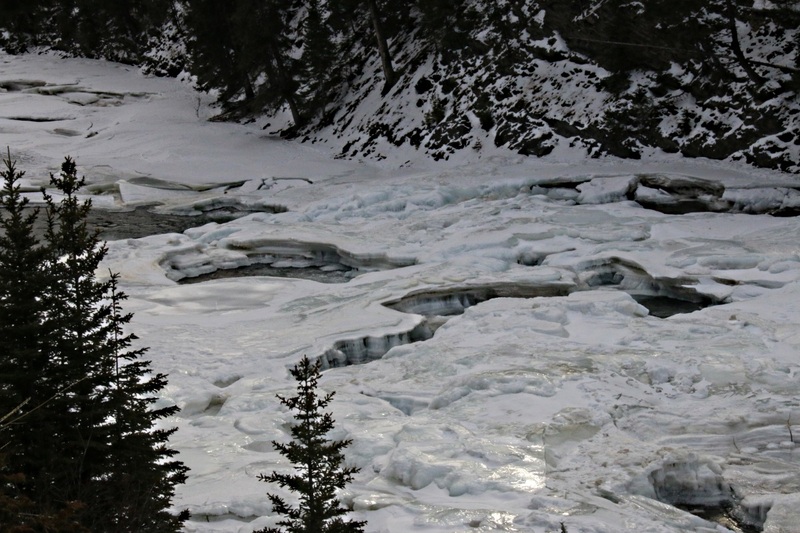 The first part of the route is on the Bow River Trail to Surprise Corner Viewpoint high above Bow Falls. Initially a surfaced footpath passing large expensive riverside houses, the trail soon leaves the built-up area, climbing steps to go along the road but with cleats over my boots I preferred to walk along the edge of the cliff looking down on the fractured ice as the flow accelerates towards the falls. 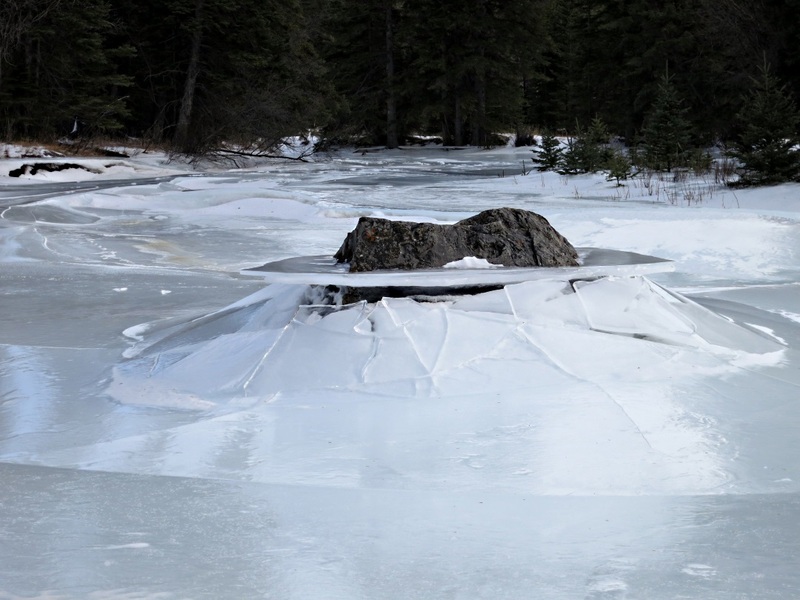 The river had frozen earlier in the winter but when it warmed up to just a few degrees below zero, the ice had collapsed as the water level dropped, refreezing as temperatures dropped again. 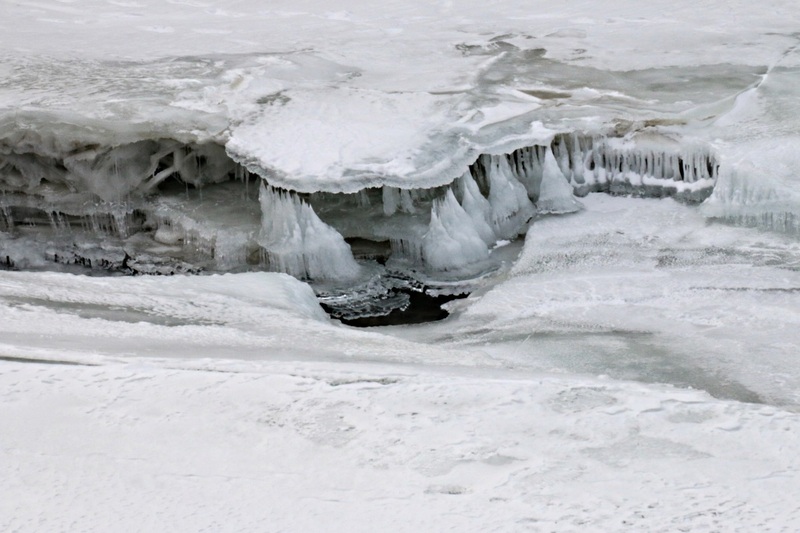 … and zooming in on the icicle formations as the river level dropped. From the car park at Surprise Corner the trail drops steeply to river level just below the falls and opposite the point where the Spray River joins the Bow. 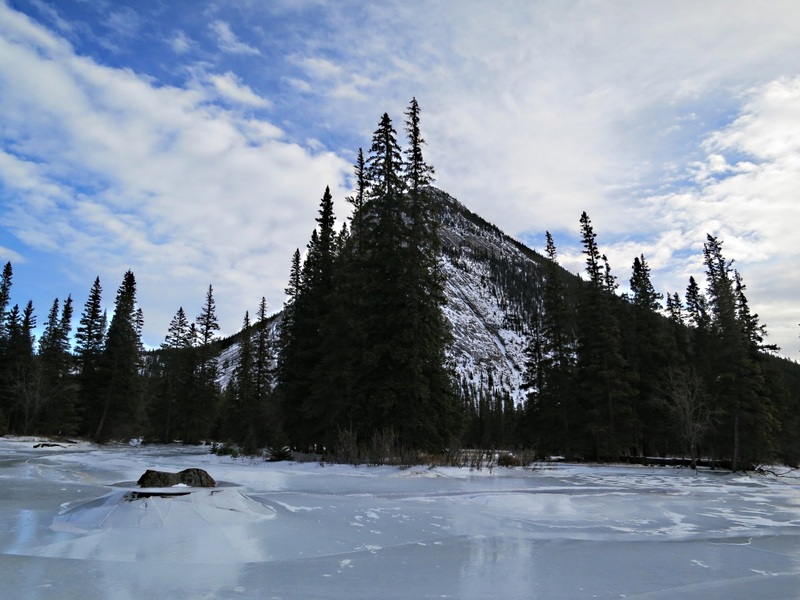 The trail then turns sharply winding its way north-eastwards following one of the channels of the braided river, Tunnel Mountain rising to 5,500 feet towering above on the left, Mount Rundle 4,000 feet even higher on the right. 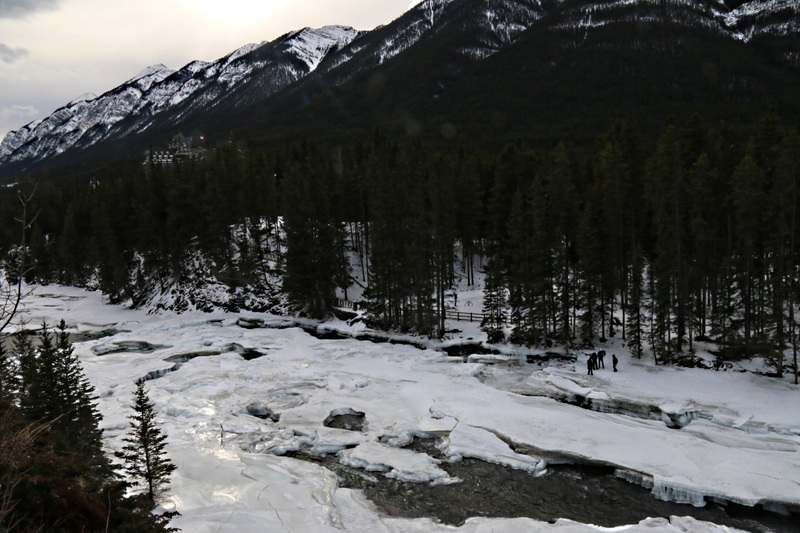 The river flows from the Bow Glacier and the Wapta Icefield, the melt-water giving the ice a pale green tinge in places, the fine Alberta snow blown off by strong winds. There is still a narrow open flow of water close to the opposite bank and with widespread signs of collapsed ice I don’t trust it to walk on. The trail has been trodden since the last snowfall and so is easy to walk with cleats but in places it has flooded and then frozen leaving the surface glass-smooth ice needing care. Go even slightly off the trodden line and the powder snow is deep and hard work. I keep my eyes open for tracks in the soft snow. There were plenty of deer and elk prints but I was looking for coyote and cougar. The main difference between coyote and wolf prints is the size, the wolf’s being significantly larger. I soon spot what could be coyote prints but I suspect are dog’s because they are parallel to and close alongside the trail rather than randomly across it. I soon catch up with the guy who is walking his Alaskan Malmute and heave a sigh of relief. “Beautiful dog. Very pleased to see it”. The guy looks puzzled so I explain why. A major difference between the prints of the dog family and those of big cats is that the former have leave claw marks. Dogs’ claws are always out, cats withdraw theirs so they don’t get blunted. There are a number of indeterminate prints in deep snow but the fine powder has flowed into the depressions so as an amateur I have no idea what they are. 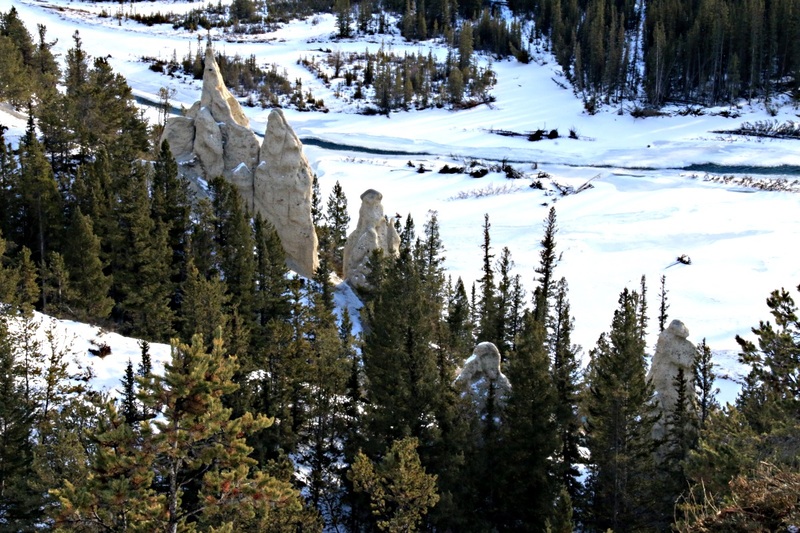 Gradually the trail winds its way upwards about 200 feet and turns eastwards to reach the Hoodoos Viewpoint above a large bend in the river with panoramic views back along the valley. 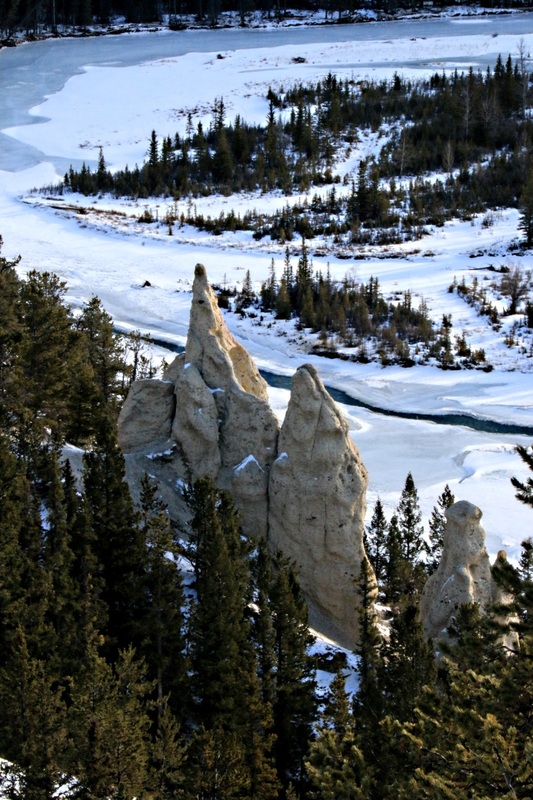 Only a few of the Hoodoos are visible from this vantage point and they are well down the steep slope towards the river. They seem insignificant against the scale of the mountain backdrop but I packed my SLR in the backpack so can zoom in on them. From the Hoodoos I head back via a trail closely parallel to Tunnel Mountain Drive and spot that cars are stopping on the road with hazard warning lights on. 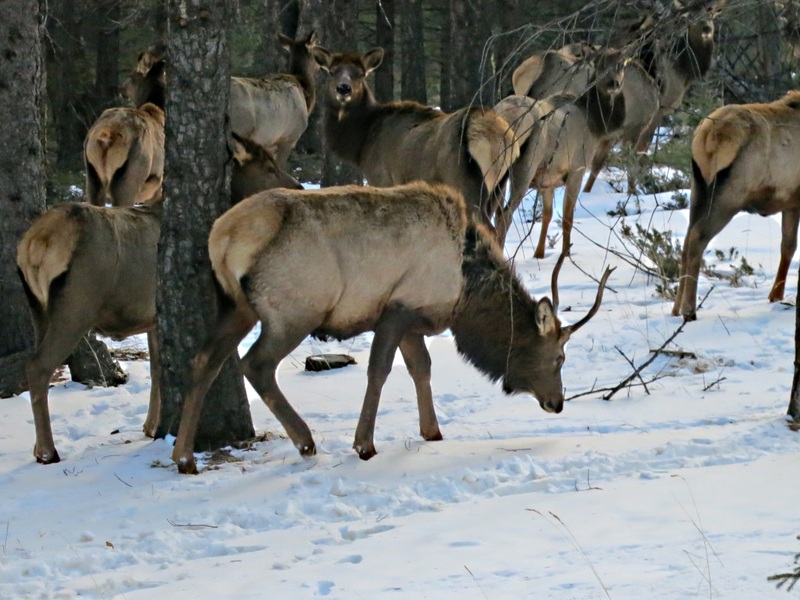 The road is covered in ice so I assume that there has been a bump but as I get closer it’s clear that they have stopped to look at a herd of 50-60 elk in amongst the trees. 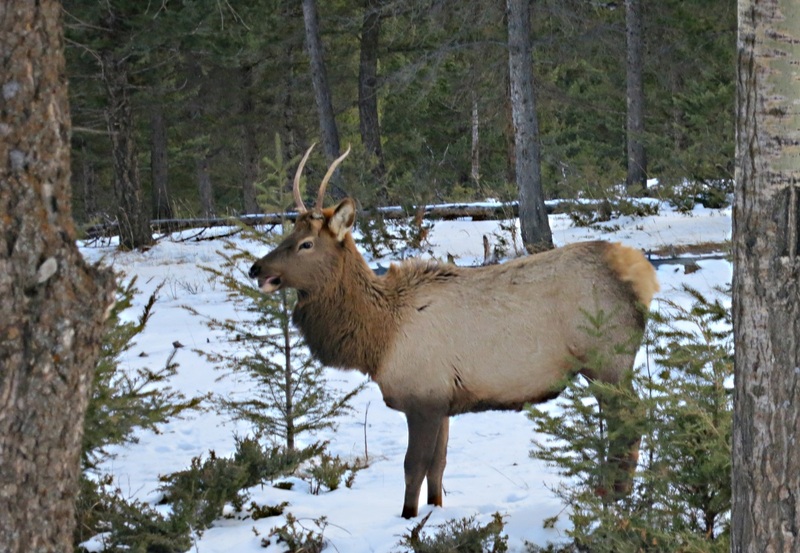 The elk, alternatively and gloriously named the wapiti (Cervus canadensis) is one of the largest species of the deer family in the world, second in size only to the moose. They are only a few yards away. Most of them are females. The dominant male, easy to spot with a large set of antlers, lifts his head, gives me a haughty look, decides I’m not a contender for his harem, not worthy of his attention, and carries on grazing, moving casually further into the trees away from prying eyes before I can deploy the camera with hands now cold from using the SLR at the Hoodoos. At the edge of the herd is a young male, not moving with the rest, looking as if he wouldn’t mind having a rumble, typical of young males of all species I suppose. I’m more wary of him than any of the others but pass by without trouble. Soon afterwards I turned off onto Tunnel Mountain Drive. Classed as a ‘scenic route’ it’s closed to traffic in winter. It soon becomes apparent why. 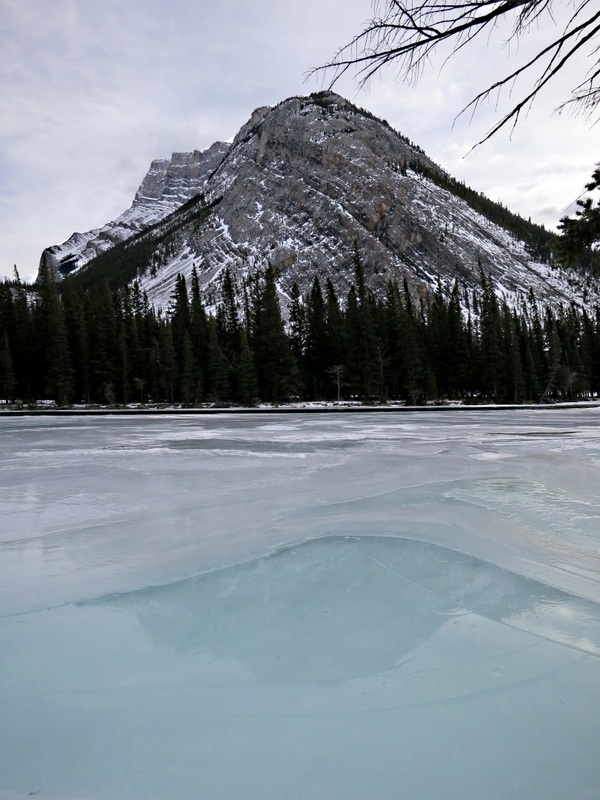 Apart from the amount of snow on it there has obviously been a flow of water across it in various places from the crags on the uphill side which has frozen into sheets of thick glassy ice, slippery (‘slick’ as they say in Canada) to walk on, impossible to drive on. I’m not a nervous guy, once being dubbed a “gung-ho XXXX” by my paraglider instructor because of a propensity to launch in marginal conditions, but as I walked along the road admiring the view over the town far below, I glance periodically at the crags on the left. When I researched cougar attacks last year I found that a cyclist had been knocked off his mountain bike on this stretch of road by a cougar leaping on him from behind as he toiled uphill. He was saved only by falling down the bank into a tree with his bike on top of him which he used to fend off the beast until his mates arrived and they all waved their bikes at it. It was later shot by the Park Rangers. I don’t like walking along roads but in winter conditions this was great, even though I didn’t have a bike with which to defend myself. In fact the whole walk was great. I need to find a way to visit the other Hoodoos near Banff. Maybe next year. 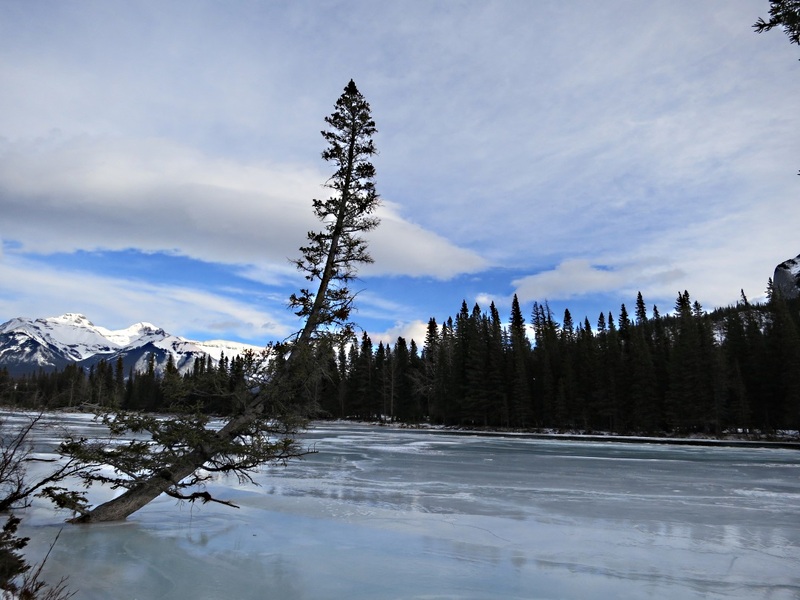 This entry was posted in Canada, Hiking, Landscape, Mountains, Nature, Photography, Wildlife, Winter and tagged Alaskan Malmute, banff canada, Banff National Park, Bow Falls, Bow River, Canada, cougar, coyote, elk, Hoodoos, Hoodoos Trail, ice, photography, Rundle Mountain, trails, Tunnel Mountain, Tunnel Mountain Drive, wapiti, wildlife, wolf. Bookmark the permalink. 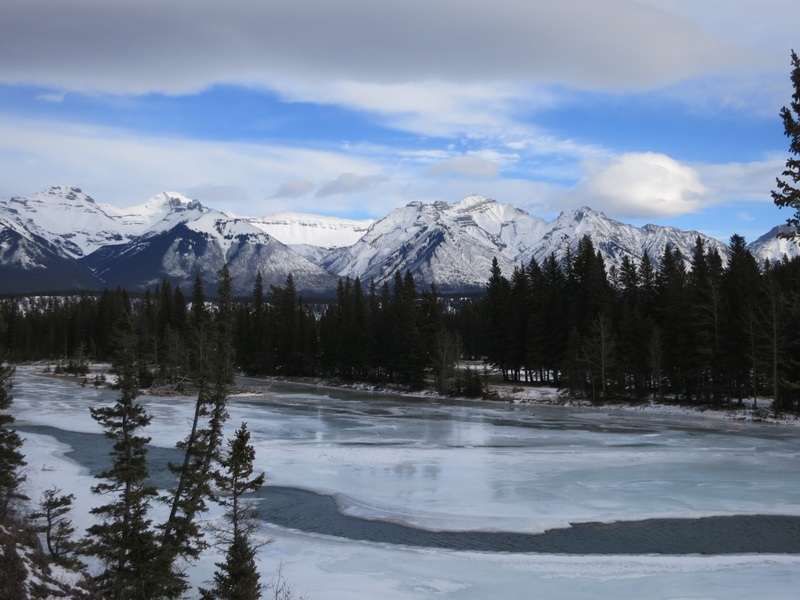 1 Response to Canadian Rockies: walking slightly nervously on the wild side.